Preventive Healthcare is indispensable to the growth of a corporate by ensuring the well-being of employees by preventing diseases. If your company is planning to invest in Preventive healthcare, this article guides you on the basic must-knows. This is the era of disruption. Organizations are slowly moving out of their comfort zones and racing against each other to dominate the market. Employees, who are the building blocks of this change, are perpetually facing the risk to survive. This continuous pressure to perform is putting the employee’s health into jeopardy, by causing severe physical and mental distress. These lifestyle diseases attack a person when least expected, giving a significant blow to both the employee’s family and the organisation. How do we prevent lifestyle diseases? Being asymptomatic in nature, lifestyle diseases can attack even a seemingly healthy person. Routine health check-ups can easily detect diseases early and allow for taking the right action at the right time. Investing in Online Healthcare can not only help in identifying ailments but also slowing them down. As per the ASSOCHAM report for the Corporate segment, it has been estimated that “For every rupee spent on Preventive Healthcare saves about Rs. 133 in costs of Absenteeism and Rs. 6.62 in Health Costs”. 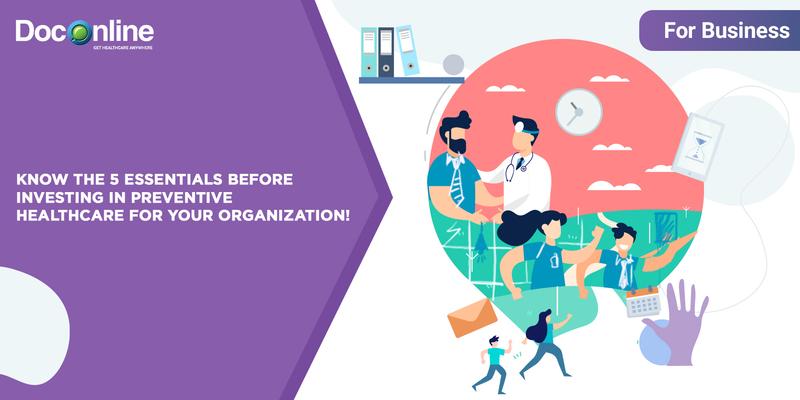 By reducing the number of diseases and increasing the life expectancy of employees, corporates are witnessing a positive impact on the overall productivity. Quality human capital is the key to the success of any organisation. How Preventive Health Care services Work? Preventive Healthcare comprises of routine healthcare checkups, discounts on health packages and wellness programs for the benefit of employees. They are affiliated with some of the best hospitals and doctors to offer excellent health services. The biggest challenge faced by any employee is dealing with insufficient communication about the health policies. Not knowing who to approach and how a system works can be an access barrier. Also, the long waiting time at health centres, delays in checkups and traffic jams can be tiresome and may become an excuse for skipping the program. DocOnline is a leading preventive healthcare start-up in India, that aims to provide anytime, anywhere healthcare to people. It offers a simple, user-friendly model that encourages proactive participation in the programs. Once a corporate has been associated with DocOnline, the team approaches the HR of the company. The HR is clearly communicated about the various preventive health care policies and services available for the employees and their relations. This information is transmitted to the employees by the HR, allowing the employees to choose the best package that is personalised and curated to meet the medical needs. Accessibility : DocOnline is an On-Demand platform that uses telemedicine to connect patients with doctors at a general physician level, anytime and anywhere. This real-time online doctor consultation is through audio, video and live chat systems. Convenience : DocOnline’s hassle-free service cuts down the long waiting time at the healthcare centres. One can talk to a doctor online in minutes through the online medical consultation app. You can get an online prescription and also get medicines delivered directly to the office or home. Secure : The digital healthcare platform ensures security and confidentiality of all the health records and online prescriptions of a patient. It maintains discretion as to who to share the information with and also protect the data from unauthorised use. Certified Doctors : DocOnline is affiliated to a panel of certified and experienced doctors who can offer the right preventive care. Providing proper diagnosis with no unwanted tests is a distinctive feature of DocOnline. Affordability : Employees and Their families can now be assured of affordable preventive healthcare through the app. By reducing the costs associated with the services, one can rest assured about getting comprehensive healthcare that fits our pockets. Unlimited Appointments : Speak to a doctor online any number of times, until the right diagnosis is made. Both the employees and their immediate family members can avail the opportunity to consult a doctor through video, audio and live chats, without any restrictions. As an adage goes, “An ounce of prevention is worth a pound of cure”, more companies are joining the preventive healthcare drive. Good health is an asset to both the employees and employers. With a wide range of customised health packages and online doctor consultation, DocOnline aspires to transform the healthcare experience for your organisation. There is no denying that Healthy and Happy Employees drive a Happy Business!